Anytime I go out to eat or to a fast food restaurant, my mind automatically thinks in terms of ways a company can save wasteful state tax dollars in its operation. Whether I am at a restaurant that hands out silverware, a fast-food chain that offers plastic silverware, or a restaurant that gives away items, the use tax issues can likely be avoided if the company practiced careful sales and use tax planning techniques. Over the past few years, a couple of cases in Alabama showcase the ongoing dilemma. The first case involved Logan’s Roadhouse. Many of us have been to a Logan’s across the country and enjoy the ability to eat peanuts and throw the shells all over the floor. But how many of us, aside from me, actually analyze the sales and use tax implications of this practice? Are the peanuts being purchased by Logan’s and resold to its customers? Or is Logan’s purchasing the peanuts for its own use as a giveaway to its customers? In a similar case, Kelly’s Food Concepts (KFC, Popeye’s, and Church’s Chicken) illustrates a common restaurant problem that has been litigated since the creation of the sales tax. Are items purchased by a restaurant such as napkins, utensils, straws, stirrers, trays, kitchen supplies, ketchup, salt and pepper, toilet paper, and other items on the table, for the restaurants use or resold to the customer for its use? Without immediately diving into the cases, it seems appropriate to explain a common problem faced by the state and local tax professional. Most states (45) have a state sales tax regime. The sales tax attempts to tax consumption by adding a tax to the end-user of tangible personal property (“TPP”). While each state various as to exactly what is and is not taxable, every state that I am aware of has a sale for resale exemption. That means that when a business purchases something it does not pay tax but rather charges tax to its customer when the item is resold. Conversely, the business is the end user on items it purchases for its own use (items not for resale) and it owes a use tax on those items. While it seems obvious whether an item is an exempt sale for resale, as shown by a couple simple examples above, this inquiry can become quite complicated. 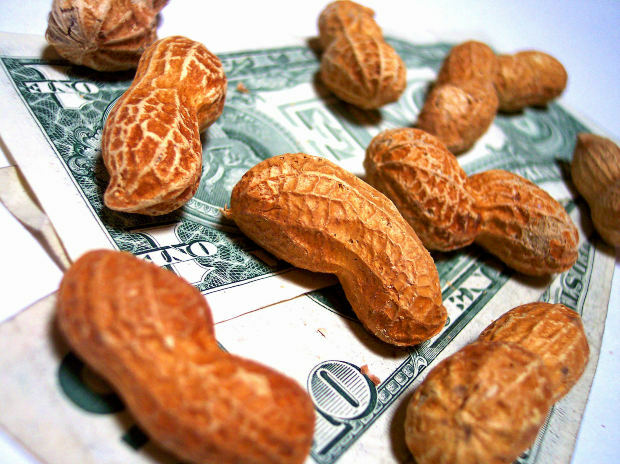 Turning back to the cases above, Logan’s successfully litigated this point in 2011 by showing that the average cost of peanuts is factored into the meal cost of the customer at $.09/meal. The Alabama court agreed that there is nothing prohibits a taxpayer for purchasing items and then reselling them as bulk sales. Being that Logan’s presented credible evidence that the peanut cost was factored into the meal cost, the court held that the peanuts were tax exempt purchases for resale. Of course, Logan’s collected tax on the meal it sold but did not owe tax on its significant peanut purchases. Conversely, in Kelly’s Food Concepts, the court determined that items like straws, plastic utensils, and condiments were not exempt sales for resale because the restaurant provided these items as a free courtesy to its customers. In its analysis the court looked to New York cases out of the 80’s (Why an Alabama cour looked to a New York court is a interesting issue on its own) involving Burger King. The first case In Matter of Burger King v. State Tax Comm’n, 416 N.E. 2d 1024 (1980), the Appellate Court in New York determined that French fry sleeves, burger wrappers, and cups were for resale because the items were “critical” to the final product sold. Four years later, the very same court ruled that napkins, straws, utensils were courtesy items because they were not critical to the item being sold. The court seems to also conclude that Logan’s was different because the taxpayer presented evidence that it used its peanut cost was used to calculate the meal cost whereas Kelly Food Concepts did not. Taking this a step further, what about happy meals in which a toy is included with the meal? Is the toy a promotional item? Or is it resold to the customer? Would Alabama look to whether a toy is a critical element of the item being sold? I am not even sure what exactly is being sold in a happy meal, the food or the happy meal? Maybe Alabama would look to see if there is evidence the toy is included in the price calculation? Like almost every state the rules seem to vary from case to case and from state to state. Like many of my readers probably know, it seems to me the question should be “who is consuming the end product, the business or the customer.” It seems to me that in both of the cases, the customer is using all of the items at issue from the napkins, to the utensils, to the peanuts. I would imagine that taxpayers take all costs into account when a pricing a product. It seems that an innovative approach to the taxpayer would be to just charge a nominal amount for the items in the proverbial grey area of sales and use tax. If a fast food chain charged an optional fee of $0.01 for the use of silverware, napkins, and condiments, it does not seem a state could take the position that such a charge is not for resale. Perhaps retailers fear the annoyance of having to explain to customers a penny for the use of certain items. In many companies the sales and use tax savings would likely far outweigh the minimal push back by customers.